The “JAM Crew” began as a childhood friendship. 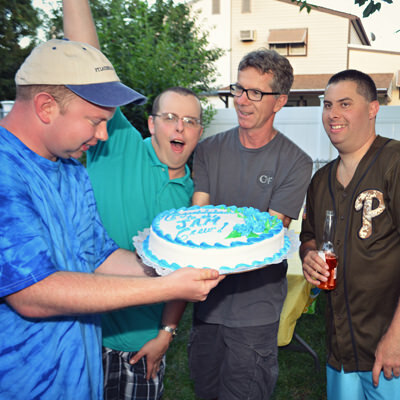 JJ, Michael and Anthony’s disability created a bond between their families. For the next 20 years, SPIN supported the men on their journey into adulthood. JJ and Anthony have a career in foodservice, while Michael works for the Navy. In 2013, the families asked SPIN to support the young men in an age-old rite of passage: moving into their own place! For the next two years, the families helped their sons develop independent living skills, while SPIN planned services, purchased and renovated a home for their specific needs. In July of 2015, JJ, Michael and Anthony moved into their new home on Jackson Street. In July 2016, the families gathered to celebrate the housemates’ first year on Jackson. For the JAM Crew, living together in their community has opened a world of new possibilities. Last year, your gift helped to create a life of possibilities for JJ, Michael, and Anthony. This year, your gift will allow us to go the extra mile for thousands of children and adults with autism and intellectual disability and their families. Whether your gift goes toward the purchase and renovation of a home for people with specific needs, support groups for parents, or scholarships for summer camp, your support makes a difference. Please make a meaningful gift today. Membership is more than an annual gift. Membership connects you a community of people who believe that people of all abilities deserve to live a life of possibilities. You can make a gift in honor and memory of someone in your life who embodies the spirit of SPIN. We have several events throughout the year to engage the community, show our appreciation, and support our programs. If you would like to support a life of possibilities while gaining exposure for your organization, consider a sponsorship. This inclusive February showstopper highlights the musical talents of SPIN’s employees and the people we support. SPIN Live is a spectacular evening of entertainment, with delicious food and a silent auction. This April event is our marquee fundraising gala of the year where we honor community leaders who support a life of possibilities. This is an elegant affair with dinner, dancing, and open bar. For supporters who are avid golfers, this May event is a fun and relaxed day of camaraderie, friendly competition, and celebration. This exciting October marathon makes room for participants of all abilities, from runners, to walkers, to wheelchair rollers. Supporters can form teams and compete for fundraising prizes. This Appreciation event is a wonderful way to start the holiday season. We celebrate members of SPIN with an evening of dinner, dancing, and recognition. A gift to SPIN in your will, trust, or by beneficiary designation can provide a life of possibilities for children and adults with autism and developmental disabilities for generations to come. 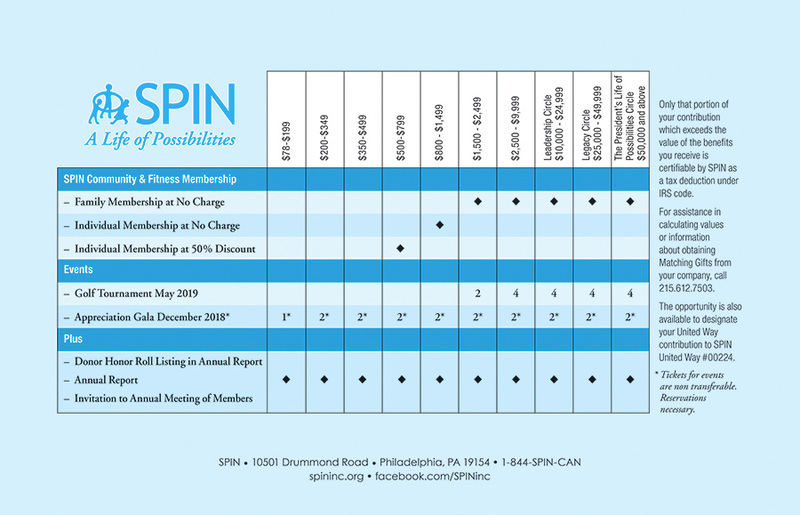 You can even support SPIN with a gift that provides you a stream of income during your lifetime. Volunteerism is a hallmark of SPIN. Volunteers play a critical role in our organization from our programs, to our administration, to our events. We invite you to share your strengths and talents with us. We welcome larger groups and organizations for special projects as well as individuals who would like long-term volunteer roles.